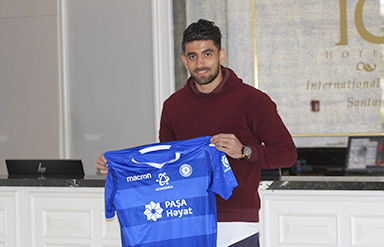 Tasnim – SUMGAYIT, Iranian forward Peyman Babaei has joined Azerbaijan Premiere League football team Sumgayit. The Machine Sazi forward has signed a two-year loan contract with the Azerbaijani football team. Sumgayit president Riad Rafiyev and Machine Sazi general manager Hooshang Nasirzadeh reached an agreement for the transfer in Istanbul, Turkey on Tuesday. Babaei started his football career in Tractor Sazi in 2014 and has also played in Tabriz-based football team Gostaresh Foolad. Babaei was also a target to join Tractor Sazi football team.